Trump’s racist ban on Muslims and refugees has already reached deep into Australian politics. Labor’s opposition to Trump has also been pathetic because they are so totally compromised by their support for offshore processing. They have been rendered mute rather than upset Trump and the US deal. Although Trump hung up on Turnbull 25 minutes into the famous phone call and tweeted doubts about the deal, Prime Minister Turnbull still says there is a deal. However, nothing but uncertainty comes out of the White House. The White House press secretary said the deal would go ahead, but insisted that refugees would be subject to “extreme vetting”, without saying what “extreme vetting” is. In Trump’s hands “extreme vetting” could be code for wide-scale rejection of refugee applications. It was the final straw for refugee groups in Australia. Since then even more doubts have emerged. While the White House says the deal refers to 1250 refugees, it seems there is no minimum figure regarding who will be resettled. Worse, the government’s own figures show that there are already 1687 refugees on Nauru and Manus—and there will be more. 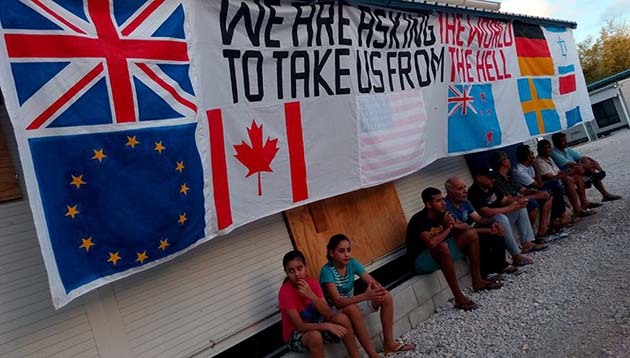 Hundreds of people on Nauru are still waiting for their refugee assessments. But even on these figures, there are more than 400 refugees who will not get a place in the US resettlement deal. The deal says priority will go to families and single women, which is a recipe for hundreds of people on Manus also being excluded from the deal. People have been on Nauru and Manus for three and half years. Some people had interviews with US officials on Nauru in December. But US officials left Nauru in February with no indication of who had been accepted. There have been no secondary security interviews. And up to 200 people have not even had their first interview. In any case, it is clear that any resettlement deal is going to take many, many months, possibly years. Trump’s anti-refugee rhetoric has horrified some families—enough for them to reconsider going to a USA where Trump is whipping up anti-refugee sentiment. The US deal was always a way for Australia to maintain its own wall to keep out refugees. It is time to abandon any idea that the US deal is a defensible solution to the three years of hell endured on Manus and Nauru. Some people might still want to take up any offer to go to the US. They should have the right to do that. But that is no reason to keep them on Nauru for something that might never happen. Hundreds of thousands of people in the US have taken to the streets to oppose Trump’s ban and his proposed wall. Demonstrations against Trump and Turnbull have brought thousands onto the streets in Sydney and Melbourne. The disgust with Trump and Turnbull will help fuel the growing demands to abandon the US deal. The Australian government is running out of options. The inquest into the death of Manus refugee, Faysal Ahmed, was told that the PNG government wants to have Manus Island closed by October. The PNG and Australian governments have forcibly deported two Nepalese asylum seekers while they offer up to $25,000 if people will return “voluntarily” to their home countries, as part of their push to clear the detention centre. But the Manus court case is set to re-open the possibilities to get orders that everyone be returned to Australia. Big nation-wide rallies on Palm Sunday, 9 April, can galvanise some of the anti-Trump feeling and turn up the heat on Turnbull to bring the asylum seekers and refugees to Australia.